Prodigy® siding from Window World of Dallas – Fort Worth not only performs year-round and boost curb appeal – it also reduces your monthly utility costs! 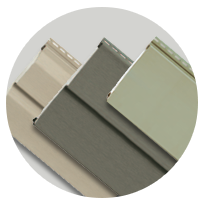 We offer a variety of Prodigy® siding profiles (Single 7, D6 Clapboard, D5 Dutch Lap) – each with energy-efficient properties to help your Texas home conserve energy year-round. During your free in-home estimate, our certified technicians will help you decide which profile is right for you. Our Prodigy® siding comes equipped with 1-½”-inch foam insulation to offer premium thermal protection in colder months and efficient respiration in the warmer Texas climate. And with a rigid, authentic outer surface, Prodigy® homes can perform for years to come. Think Prodigy® Siding could be right for your Dallas – Fort Worth home? Contact us today for your free home estimate!